On getting many good things done. And no one knows you’re doing any of it. If someone has volunteered to help your project, take the time to write a 2-3 sentence summary of what they did to help. Let’s spend some time celebrating our successes and all of our contributions! Let folks know you’re celebrating that success using #LABHR as a hashtag. #LABHR stands for Let’s All Build a Hat Rack. For why its an awesome acronym, you have to read the post. While at linux.conf.au this year, I had the honor of connecting two good friends, Deborah Nicholson and Michael Howden. As part of his role as the CEO of the Sahana Software Foundation, Michael was seeking additional expertise for Sahana’s Advisory Council. I knew Deb would be a great fit; she’s performed a great deal of vital work in the technical community, and I’ve always found her advice to be invaluable. As a member of the Sahana Advisory Council and Emeritus Board Member, I welcomed the opportunity to actually work directly with Deb on a project. I’d watched her in action for years, at the FSF, at the Open Invention Network, as a community leader and mentor on projects like Girls Rock Camp and, along with Mairin Duffy, a pilot program to teach young women graphic design using only Free Software tools. In short, she rocks! I walked up to her and Michael, cappuccino in hand, as she was accepting his request to join the Advisory Board. As congratulations and thanks went round, Deb said something that really stuck with me. I’ve been turning it over in my mind since. This. Yes. This. A thousand times this. I’m not going to harp on this topic, as other people have written brilliant treatises on the dynamics of unpaid labor, especially in the open source world. Go read them. Recommend new ones to me. It’ll be great. It’s also not something I’m going to argue about in this post or the comments section. This post gets really long. And it talks about why I think all these things are important. You can skip to the conclusion and just read about how I’m performing an experiment to improve things. I hope you’ll join me. Deb’s words stuck in my mind deeply for a few reasons. One, I’m privileged enough to know Deb socially and I’m very well aware of all the contributions she makes to our community. I know how hard she works, which organizations she volunteers for – on top of her day job advocating for the rights of open source software creators – and how incredibly smart, strategic and patient she is because I get to talk to her all the time at conferences. Not everyone knows these things. And they wouldn’t know just how much Deb knows because so much of the work she does gives her no place to hang her hat. In the free and open source software world, we already know that code is king. You can also read about that approach and its discontents. There are any number of tasks required for projects to grow and thrive. And, in many projects, non-code contributions are still not celebrated or are underappreciated. So it’s pretty tough to describe what you do and what value you bring, as a community builder and advocate and non-coder, in the open source world. It’s even more difficult to summarize what you do and who you are on a curriculum vitae or LinkedIn profile. And when you’re committed to the cause of community, you sign up for a lot, a lot of it not particularly visible, and you’re not necessarily terribly motivated to toot your own horn. Terribly motivated to grow more people who want to do this strategic thinking, gathering of humans together, and providing vital social connective tissue? Sure! Doing this work is necessary. There are not enough people to do it, and as our lives become more interdependent on a macro-scale, our needs to be interconnected at a micro-scale are becoming ever more important. And along with the “soft skills” side of this work, there’s a huge level of technical knowledge required to get things done. How do you explain to people that while you’re busy doing all of the above, you’re a great writer and can edit that newsletter / write that press release / QA that blog post / rustle up some other volunteer help / find a place for the group to meet / this list is endless? That you can do all of this stuff while doing a ton at your day job? And while doing all the things you just need to get done to be a person, like managing your finances and taking care of your family and trying to eat healthy and get exercise? It’s really easy to fall into the trap of not talking about these accomplishments, because they are usually piecemeal, discrete tasks. The requests come in early and often. They are important tasks, but they are seemingly ephemeral. There’s no place to hang your hat on them, no matter how good and necessary it is that they get done. And I’ve also been thinking about how much of this trap is about how women are socialized to minimize their accomplishments, when men are socialized to overemphasize them. (#NotAllMen) And I’ve been thinking about how much that’s probably hurt me professionally, because I haven’t always had or made places to hang my hat. Most people have no idea what I’ve accomplished or what topics I know about, and its not because they think I am incapable. There’s just no place for them to get an overview or appreciation. I’ve also been thinking about how much not celebrating and documenting our accomplishments has hurt my friends professionally. (N.B. : This is not some #LeanIn style argument here.) I think about how many of us are working hard to keep our careers in top shape, our partners and families cared for, our communities fed, and ourselves cared for with what is leftover. Finding the time in that to celebrate and document your successes, and finding the energy to do it in a world where science has shown that women are punished for asking for a seat at the table, is just not easy. Even asking someone else for help to celebrate and document your successes can be quite difficult for some of us. I don’t think women are the only ones who are bad at celebrating and documenting their achievements. I think many humans struggle with it, and ever more is demanded of our ability to curate online personas. And to make them “sell.” It’s dead obvious, but its less about what you know and much more about how you can package that knowledge so someone else can consume it. So that the person who you really are looks like the person people want to subscribe to. So that you can create a representation of your life digitally that captures all the promise of who you really are, while covering all your human foibles as neatly as you can and care to. It’s just an uncomfortable space. At least if you’re me. But it is where we find ourselves. I’m tired of my friends not having a place to hang their hats. I’m tired of not having my own hat rack, too. 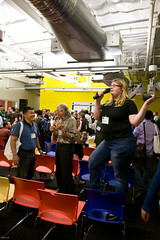 I organized more than a hundred conferences, sprints, meetups and events at Google. My only reminder of those accomplishments is when one of the geeks I meet reminds me that we met at one of them. Some of the best work of my life took place on a closed mailing list. The strategic guidance, along with plain old project management, I’ve done for a variety of causes, people and organizations lives nowhere except in the heads of everyone I worked with. The experiences have moved me, shaped me, given me more to bring to bear in each new challenge I face. And I want to eliminate the challenge of people not having the background they need to understand what I can bring to bear, because the constant effort of reproving my competence over and over again in social and professional scenarios is tiring. It’s a waste of energy. It’s a waste of everyone’s time. So, perhaps “let’s all build a hat rack” (#LABHR) is a bit silly. And I don’t really care. I feel like I need a bit of silly. There has been so much awfulness in the world of late, and so much awfulness in the news about the technology industry in particular. Well, in particular if you work in said industry and follow the news. It’s all over the news in my last hometown, and ridiculously prevalent in the area where I was born. It’s at the Crunchie Awards. It’s hearing about Breitbart for the first time, realizing I’ve managed to lead a privileged and sheltered life by not knowing about it, and wishing I’d never known the site existed in the first place. It’s in every missed opportunity that leaves you wondering if it was because you weren’t in the right place at the right time, or because of who you are. I can’t change the world, but I can change me and suggest a useful way for all of us to create positive change. Take the time to write up a short thank you note about what someone has done to help your community, organization or project. Doesn’t have to be complex, 3 bullets / sentences will do. There’s even a sample at the end of this post. Send the write up to this lovely human with your thanks for their contribution. Steps 1 and 2 are mandatory for the experiment to work. Steps 3-5 are all (important) gravy. Updating my own LinkedIn profile to be current and up-to-date on the basics, like making sure the projects I volunteer for are simply listed. Seems silly to ask other folks to help me and others celebrate our successes if I’m not doing the groundwork myself. Writing up a LinkedIn recommendation for my former interns and co-volunteers on a couple of open source software projects. This activity is just good practice, and I’ve let it slip by the wayside because I was busy and they had formal status reports. A formal status report isn’t a place to hang your hat. While not strictly related to her work as an OpenHatch board members, Deb has given me invaluable counsel on fundraising for various non-profits I’ve been affiliated with. She’s also trained numerous community members on how to perform in-person advocacy for free and open source software projects, and software patent reform. As part of that training, she’s also convened numerous meetings and round tables to help people get things done in the open source world. She performs all this work with grace and patience for our sometimes difficult personalities. She’s brilliant and utterly unflappable. Cannot recommend her work highly enough. This entry was posted in learnings, women in tech and tagged #LABHR, experiments. Bookmark the permalink.